When it comes to a rear-end collision, most people assume that the driver who does the rear-ending is always at fault. While this wide-spread belief makes sense on the surface, it isn’t always the case. Typically, the driver who rear-ends the other driver is driving dangerously and receives a citation for doing so. However, just because one driver is ticketed in a collision, it doesn’t absolve the other driver (or drivers) from all responsibility. If I hit someone from behind, am I at fault? Driving in a way inappropriate for conditions. For example, changing lanes quickly in the midst of a snow or ice storm could yield a ticket. Who is at fault in a rear-end collision with multiple cars? Unless a driver admits to being distracted or driving dangerously it can be difficult to determine who is at fault in a wreck involving multiple cars. A simple example with three cars gives a decent illustration of fault in a crash with more than two vehicles. If two cars are stopped, one in front of the other, and a third car rear-end the second car, causing the second car to hit the first car, the driver of the third car would be held responsible for causing both of those rear-ending. 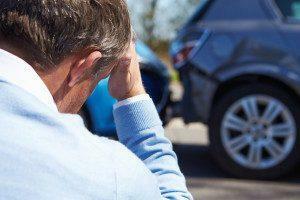 In any circumstance when the rear-ender feels they are not at fault for the accident, having witnesses can be crucial. A rear-ending situation that many drivers are probably aware of is known as the “swoop and squat.” More common in the ‘90s, this two-car technique was created by fraudsters to get cash out of unassuming drivers. One car is in front of the innocent driver, while a second car speed-matches to the side. The front car suddenly slams on its brakes, and since there is another car to the side, the innocent driver is unable to swerve out of the way and slams into the back of the lead car. The driver of the rear-ended car will immediately place blame on the person who did the rear-ending. The cars will oftentimes also be filled with passengers who will make injury claims, all in hopes of adding more to the bottom line of their scheme. While this practice was outed after the death of one of the “swoop” drivers in the ‘90s, it is still something to be aware of. Determining negligence can be critical to figuring out who is at fault, and how much that person is at fault when it comes to a rear-end collision. Liability percentages can change based on negligence from each driver. If you fail to meet expectations of what a reasonable person would do while driving, you are considered negligent. Some negligent actions include not using a turn signal, following too closely, not yielding the right of way, and not paying attention to the road and potential hazards. A rear-ending car crash involves more than one car. So what happens when not just one of the drivers is at fault? That’s where comparative negligence comes into play. Comparative negligence means more than multiple drivers can be at fault for a percentage of a rear-end crash, although it can be difficult to determine those percentages. If a driver is rear-ended by someone after coming to an abrupt stop for a hazard in the road, it may seem black and white that they are not at fault. However, if that driver was looking at their phone while driving, then looked up and suddenly had to stop for a hazard they may have seen earlier, they could be held liable for a certain percentage of the crash. If you or the other driver incur serious injuries as a result of rear-ending, determining who is at fault can make a big difference in your insurance premiums as well as your financial bottom line. It can make good financial sense to fight a traffic ticket, and if you both were ticketed, this can make your auto accident claim confusing and lead to prolonged legal battles. If you think you’re not at fault, talk to a lawyer. Your attorney may use defenses you don’t even know about and can use the law to argue both that you weren’t at fault and that the other driver’s insurance should pay to cover your injuries. If you’ve been injured in an accident, contact one of the experienced Colorado auto accident attorneys at McDivitt Law Firm today to request a FREE consultation.